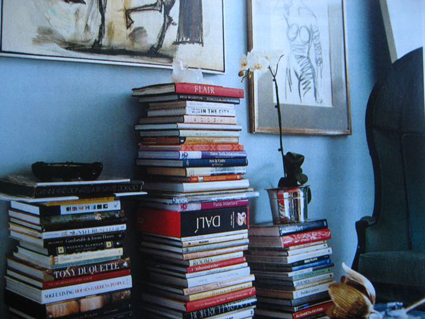 Topped with an object, orderly piles of orphaned books and magazines look deliberate even when resting against the wall — and not like you desperately need shelves. Korban likes to dress his with plants or figurines. 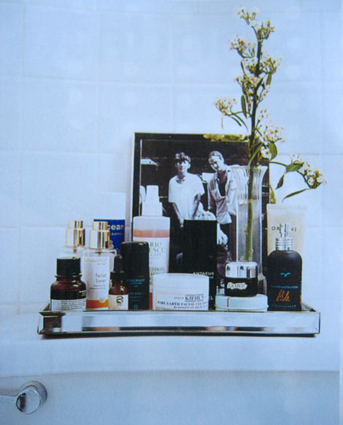 Instead of crowding your sink with creams, put your products on display. Korban creates a back-of-toilet tableau by grouping his on Venetian glass, arranging jars up front and tall bottles in the rear for easy access — and decorates them with a framed photo and fresh flowers. 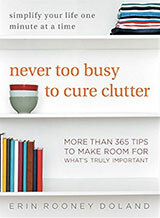 The whole February issue is dedicated to the organized home, so be sure to check it out. Unfortunately, we got word on Wednesday that Domino is closing its doors. So, unfortunately, this may be my last fun post about the great magazine. Domino, you’ll be missed. Reader Amanda recently e-mailed and asked a few questions about laundry maintenance for a family of four. She wanted to know how many loads of laundry a typical family might do in one week, how long this would take, and what routines could be put into place to handle these loads. After doing some research, math, and making a few estimations, I think I finally have a few answers for her questions. 1. How many clothes can a washing machine hold in a single wash? First off, know that there are not standard load sizes for washing machines. Phrases like “mid-size capacity” or “ultra capacity” mean different things from manufacturer to manufacturer. The number you need to determine how many clothes a washing machine can effectively handle at a time is its pounds of clothing per load. For example, Whirlpool states that their top-loading washing machines can handle 12 to 18 pounds based on model. And, their front-loading machines vary from 12 to 20 pounds based on model. But, Whirlpool doesn’t provide in their product descriptions anything other than drum sizes of models in cubic feet. A machine’s drum size is irrelevant because it has no bearing on the motor’s ability to handle the weight of the clothing in the drum. To find out the weight your washing machine can handle, you may have to do what I did and call the store where the washing machine was purchased. I learned that my “large capacity” washer can hold just 12 pounds of clothing. To learn how much 12 pounds of clothing is (or whatever your washer can handle), stand on a scale empty handed and weigh yourself. Then, have someone pile into your arms pairs of jeans. When the number on the scale increases 12 pounds over your empty-handed weight, you’ll have an idea of your washing machine’s capacity. For me, this came out to be between 9 and 10 pairs of jeans. Try the same thing with other clothing items to get a full picture of what your machine can handle. 2. How many clothes does an average person wear in a seven day period? Obviously, this number varies based on the person. However, I was curious about how much clothing I dirty in a week. So, I abandoned my normal twice-weekly washing routine and weighed all of my dirty clothes at the end of the week. Turns out, I wore 16 pounds of clothing last week. My husband’s clothing came in at 17.5 pounds. Honestly, I was blown away that we dirty so much clothing in a single week. But, since we both started working out every day in 2009, we now dirty at least two sets of clothes a day. Between the two of us, we had three loads of clothing in a week (well, actually four because I had a delicates load). 3. How many towels and sheets does an average person go through in a seven day period? Again, this number will vary based on personal preference. In our house, my husband and I combined go through 1 set of queen sheets, six washcloths, two kitchen towels, four bath towels, and two hand towels per week. This turns out to be less than 12 pounds, but unfortunately all of it won’t physically fit in a single load in our washing machine. So, the sheets get their own load and the towels get another. If you’re keeping track, this means that our family of two generates five or six loads of laundry most weeks. 4. What is your best guess for how many loads a family of four would generate in a week? Kids seem to generate a lot of clothing — spills, sports practices, uniforms for after-school jobs, indecision about what to wear, etc. If I generate 16 pounds of clothing in a week, I imagine that a middle schooler or high schooler could easily create 14 to 15 pounds of clothing in a week. Multiply that by two and add in two adults, and a family of four probably generates between 60 and 65 pounds of clothing per week. In our washing machine, that would be five to six loads of clothing. Then, figure in a load for all of the bedding for a week (three sets of sheets can probably fit in one load), and two loads for towels (12 washcloths, two kitchen towels, eight bath towels, and four hand towels), and a typical family of four probably generates between 8 and 10 loads of laundry per week. 5. How long does it take to do the laundry? Again, this varies based on the machine you have and what you’re laundering. But … in our home, a full cycle in the washing machine is 35 minutes and most everything is dry in 55 minutes. A single load from start to finish in the machines takes 1.5 hours and then another 15-20 minutes to fold and put away. It can be a two-hour chore for a single load of laundry. Eight loads of laundry would take roughly 10 hours to complete. (That is estimating 35 minutes to wash the first load without anything in the dryer, 440 minutes to dry 8 loads of laundry, and 120 minutes of folding and putting away time.) Ten loads of laundry would take just over 12 hours to complete. 6. What is a reasonable laundry routine for a family of four? Reasonable is a pretty vague term in this instance, so feel welcome to offer up alternatives in the comments section. Sunday: Rest, or launder a load of delicates. 7. What are some additional tips and tricks? Check out my previous posts on getting laundry under control for additional suggestions for tackling this beast. For the second week in a row we have a before-and-after selection for our feature. 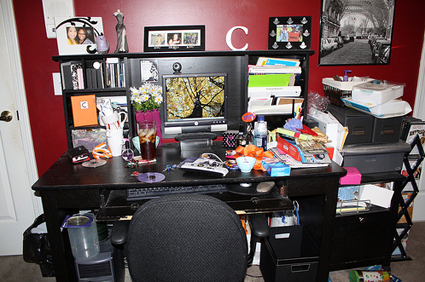 I really enjoy the after picture and seeing how she contained, cleared, and cleaned up her space. You can read more about her experience on her blog. Thank you, Leia551, for your inspiring submission! I still remember my first electric guitar. I’d plug that shiny black Strat knockoff into my little red single-channel amp, crank that sucker to eleven, and let her rip. Jamming along with songs on the radio or my favorite tapes and CDs was fun, but it wasn’t long before I was disappointed with the sounds I got out of that amp. For the next decade, I battled an affliction that plagues many hobbyists known as G.A.S. — Gear Acquisition Syndrome — a compulsive pursuit of the shiny brand new. Amps, guitars, pedals, effects boards, speaker cabinets. I wanted anything that I thought might help me find that perfect tone to let me rip like Slash or groove like Stone. I don’t even dare to think about how much time and money I must have spent buying all that stuff, lugging it around and storing it over all those years. Thankfully, most of that stuff is gone now. When I record at home, I use Apple’s Logic Studio which does a reasonable job of replacing all of that equipment I bought, sold, and lost over the years. It’s a pro software bundle at an amateur price, though there’s definitely a learning curve. Logic Studio may be for the advanced user, but Apple hasn’t forgotten about the beginners. By now, most Mac users know about GarageBand. Apple has included it as standard software on every new Mac since 2004, and each year it gets better. The new iLife ’09 suite updates GarageBand with several exciting new features that will help beginner, and even advanced, guitarists keep their hobby clutter-free. Apple added more guitar sounds and effects, and an intuitive new interface that lets you visually tweak your “rig” without the cost and clutter of buying tons of equipment. Add pedals or switch out entire amps with a click of the mouse. “Basic Lessons” help you learn new songs at your own pace, complete with a backing band, while “Artist Lessons” let you learn your favorites from the original artist. Pretty cool. Do you have a small kitchen, but want extra counter space to prepare your meals? Unfortunately, a small kitchen has limited options for improvement. Either you make more room by taking advantage of a table in another room, or you move to a place that has a larger kitchen for your meal preparation. The Folding Kitchen Island is a much more convenient option. As you can see from the picture, the folding island can be folded flat and tucked away when not in use. This a great space-saving option that serves up more counter space when needed. It measures in at 23″ x 22-1/2″ x 36″ high when unfolded and ready for use. 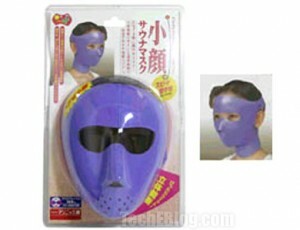 Have you always wanted to wear a hockey mask for hours a day, like Jason does in the Friday the 13th movies? If you have, AND you want a more slim face, then the Japanese Face Slimmer may be the perfect product for you. Sure, you may terrify small children, but isn’t that really part of the plan? Fear and a slimmer face — maybe this isn’t a unitasker after all! I’m not exactly sure how the face slimming actually works (crushes your bones? causes you to sweat so much you become dehydrated? ), but don’t let things like “doubt” stop you from ordering this attractive item. You’ll be all the rage at the grocery store, your son’s little league practice, and driving down the road being chased by the cops! My 2009 new year’s resolution is to get e-mail under control. In the past, I’ve tried every system you’ve heard of (and probably dozens more) to manage my accounts, and none of them have worked for me over the long term. This year, I hope to find a more permanent solution for my e-mail needs. My resolution goals for January have been to get the technical problems of my e-mail fixed. I have two devices (my laptop and my iPhone) on which I regularly check and respond to e-mail from four e-mail accounts. Up until last week, my two devices didn’t talk to each other. Every e-mail I received and read on my laptop was still unread on my iPhone, so I was handling every e-mail twice. Additionally, I was receiving in my inboxes about 400 pieces of spam every day. I would waste half an hour a day simply weeding through the spam. These two problems had to be solved before I could even think about getting a handle on my other e-mail problems. For more than 15 years, I have been using POP (Post Office Protocol) to download my e-mail from my server to my e-mail program. It served me well until I started using my phone as a second device for checking e-mail. Since POP doesn’t allow for multiple e-mail clients to tell each other, “hey, I already read that,” I had to handle each e-mail more than once. To solve this problem, I changed my e-mail access protocol from POP to IMAP (Internet Message Access Protocol), which allows my different e-mail clients to speak to each other through my mail server. Honestly, I am very upset with myself for not doing this earlier. 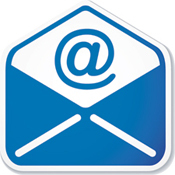 If you want to make the switch, too, start by contacting your e-mail service provider to make sure that they offer IMAP. Once you determine that they do, check out your e-mail service provider’s website to see if they already have directions for how to make the switch for your particular system (Comcast, Verizon, etc.) and client (Outlook, Mail, etc.). My e-mail provider had extremely detailed directions that I could follow. If this information isn’t easily found online, call your provider’s customer support line so that they can direct you to the best instructions for your system. If you only use Gmail for your e-mail, follow the instructions on Google’s website. To help fight spam, I enabled a server-side spam filter on my mail system. I talked with my e-mail service provider and learned about how I could make the threshold more selective so that spam no longer makes it into any of my inboxes. Check with your e-mail service provider to see if they have server-side spam blocking available. If they do, they probably have a way for you to set the threshold level for that spam filter. Additionally, many allow for you to create “white lists” that let you receive e-mail from specific addresses that might otherwise be blocked by a spam filter. For example, I buy my favorite t-shirts online from Gap. Since I know they will send me receipts after I place my order, I have gap.com as a white listed address. If I didn’t make this adjustment, my spam filter might think that it was spam and not allow the receipt e-mails to arrive. Additionally, Gmail has a great spam filtering system and is the best that I have found in the free e-mail system market. Unfortunately, three of my four e-mail accounts are not through Gmail. 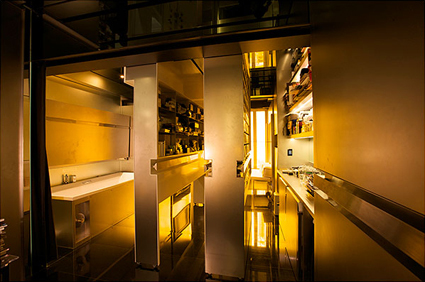 Architect Gary Chang’s Hong Kong apartment is the gold standard in space-saving solutions. His 344 square-foot apartment has an open floor plan, but with a series of sliding wall units, can easily be configured into 24 different rooms. In Mr. Chang’s solution, a kind of human-size briefcase, everything can be folded away so that the space feels expansive, like a yoga studio. The wall units, which are suspended from steel tracks bolted into the ceiling, seem to float an inch above the reflective black granite floor. As they are shifted around, the apartment becomes all manner of spaces — kitchen, library, laundry room, dressing room, a lounge with a hammock, an enclosed dining area and a wet bar. Thank you to reader Josephine for sending us the link for this article. One of Powermat’s products is the “electric” counter top. The video below shows a stand-up mixer running on nothing else but the Powermat technology. The mixer has no power cord and is equipped with a Powermat receiver on the inside. 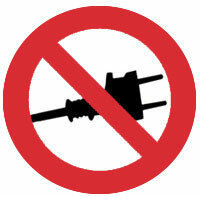 The option of running non-Powermat equipped products is also possible by using a wireless outlet that is equipped with the receiver. The technology is safe when exposed to water and can power the 300 watt mixer on full power with no problems. Watch the video for a better idea of how Powermat can change the way we power our small kitchen appliances. I’m looking forward to this product hitting the U.S. market. My father, a photographer, put a camera in my hands at a very early age. I have taken hundreds, often thousands, of pictures a year for most of my life. And, as a result, I have boxes and boxes of print photographs taking up space in my closet. One of my goals for 2009 is to have all of my old photographs scanned so that I can have digital copies of these pictures. We’ve talked previously about services that will scan your photographs (in addition to ScanMyPhotos, commenters also recommend ScanCafe and LifePreserver), and having my photos scanned is the first item on my to-do list for this project. While I’m trying to decide which scanning service to use, I’m also deciding what to do with the photographs once they’re scanned. First up, I’ll be sure to backup the images; I’ll put copies of the digital image DVDs in my safety deposit box at the bank and I’ll upload the image files to my online storage system. I value these images enough to pay to have them scanned, so I should also pay to have them protected from fire and natural disaster. 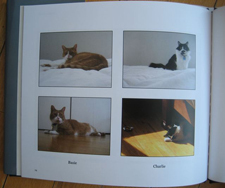 Finally, I plan to use Blurb to create a handful of albums that I want to store on the bookshelf for guests to peruse. I used Blurb in December to create four photo albums and was very impressed with their service. I’ve used the Apple system in the past, but the quality of the Blurb book is leaps and bounds ahead of Apple’s product. The books I ordered from Blurb were hardcovers with glossy jackets, full color interior, and 100-pound silk-finish paper. With shipping, I paid less than $150 total for the four albums. It may sound like a lot, but their quality appropriately matches the price. Alternatively, if you decided to go with a paperback cover, no book jacket, and non-premium paper would significantly reduce the price per album. I will add that I do have one complaint about Blurb and that is if you use their templates you can’t move any elements around on the page or resize any objects. This isn’t an issue just with Blurb, though, a handful of other album printing companies have the same restrictions. You can import full pages from programs like InDesign (Mac and PC), but then you’re not able to use the templates. Inside sources have told me that there are some improvements coming down the pipeline, and I hope altering templates is one of them. For those of you who have already gone through the process of scanning all of your old photographs, what have you done to manage the files? Please let us know your plan of action in the comments. A few years ago, I donated a few bags of clothing to my local Goodwill. Unfortunately, before the bags of clothing were actually donated, they were in the trunk of my car for almost eight months because I forgot about them. When I eventually went to donate the clothes, my local Goodwill informed me that they were no longer accepting donations at that location. So, I ended up driving to a location in another town to eventually donate the clothes. I’ve recently decided to purge some clothing and this time am donating my clothes to the Vietnam Veterans of America. The VVA sent me a flier a few weeks ago letting me know that they would be in my area picking up donations (which, come to think of it, may have been the reason I got in the purging spirit). 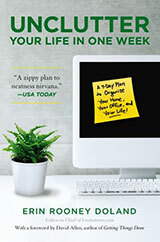 I went to www.SCHEDULEAPICKUP.com and scheduled my pickup for February 2. (You can check out the site, too, to learn when they’ll be in your neighborhood next.) It was so easy. I don’t have to do anything except put all my donations into bags for their eventual pickup. The VVA sells the donated household goods to private companies by annual bid. The funds provide almost half of their annual needs to support local, state, and national service programs (e.g., homeless veterans, agent orange related health programs, improved hospital care for veterans with disabilities). The VVA is a great cause, they make clothing donation easy, and it unclutters your closets and dressers. I’ll still donate to Goodwill, but the VVA is getting some of my clothes this February. 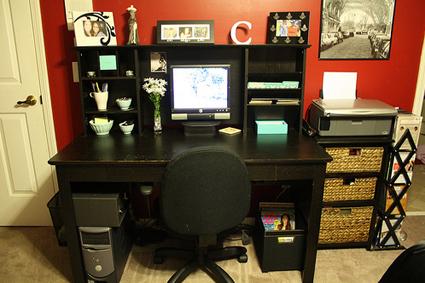 This week’s Workspace of the Week is Tabitha’s refreshed space. This is another one of those times when the person who submitted the images can do a much better job of explaining the space. 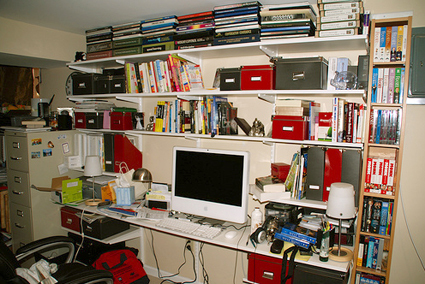 I recommend going to Tabitha’s blog and reading a full step-by-step run down of how she transformed her office into a beautifully organized space. Thank you, Tabitha, for submitting your office and for such a wonderful description of how you made it possible!